Three of the most popular home renovation projects are kitchen, bathroom, and landscaping improvements. They can make your whole home feel almost brand-new! But when you consider the environmental impact these projects can have — from the energy it takes to produce building materials to the amount of waste a project accrues — you may think that your dream of a new home will be a nightmare for the environment. For instance, an Environmental Protection Agency (EPA) study shows that 548 million tons of debris were created by construction and demolition in 2015, and many of those materials were toxic or hazardous. But that doesn’t mean you should let your dream die! If you’re considering making changes to your home, why not do them in a way that also minimizes your carbon footprint? 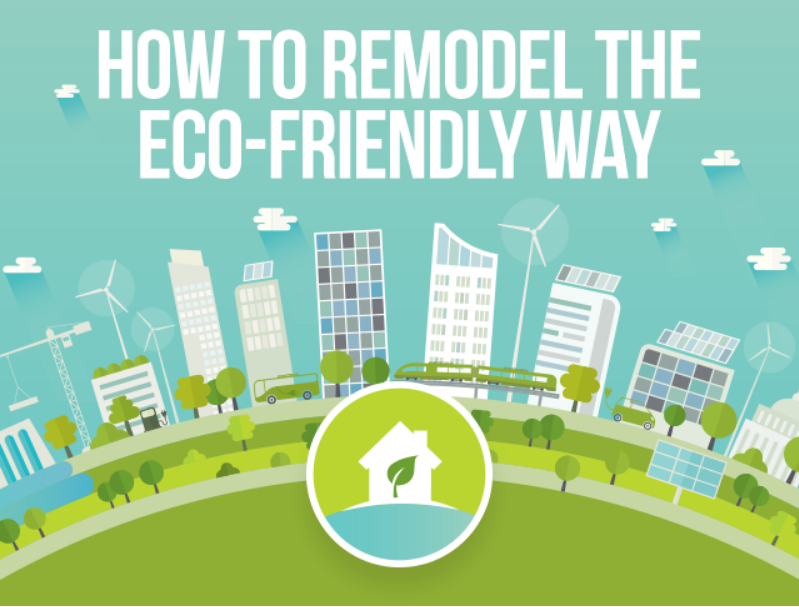 It’s easier than ever to make eco-friendly and sustainable upgrades, and as the going-green mindset has expanded, the costs of green renovations have declined. Just keep in mind the following tips as you prepare to renovate, and you’ll have a refreshed space that any homeowner (and nature lover!!) will be proud of. Note that these aren’t necessarily the projects that will bring you the best return on your investment when you’re ready to sell your home; these are the projects people want to tackle. For more information on renovations and ROI, check with your expert real estate agent. Going green in the kitchen can save you energy and money! Green up by choosing new appliances endorsed by ENERGY STAR.TM Technology is constantly innovating new means of conserving energy, and ENERGY STAR appliances are tested to ensure they are the most energy efficient in their category. There are many sustainable materials you can choose for your flooring, such as cork, tile, bamboo, and linoleum. (Yup, linoleum is environmentally friendly! Who would have guessed?) Some need more care than others, but all will make your kitchen greener. For your counters, consider concrete, recycled glass or porcelain tile, quartz, or stainless steel. Adding double-paned, energy-efficient windows or skylights is the best way to brighten your kitchen and give yourself more light to work with, but if this is not an option, be sure you’re using LED bulbs to conserve energy and save on your electric bill. A fridge with a top freezer is more energy-efficient than a side-by-side style! Even if you’re not preparing to sell your home, updating your landscaping is a fun and beautiful way to make a change. The idea of eco-landscaping is to encourage wildlife, reduce pollution, and save water and other resources. Choosing native plants helps your garden grow lush, with less help needed from you. For example, if you’re in a naturally dry area, skip ash and oak trees, irises, hibiscus, and dogwood shrubs. Instead look to bougainvillea, verbena, and lantana for color and evergreens, crape myrtle, and sycamore trees. Ideally, hire a company that provides eco-landscaping services to bring in other elements that are best suited to your climate, whether they be a water feature or a rock garden. Skip the chemicals and choose natural fertilizers such as manure to provide nutrients and keep your soil healthy. Also, consider composting, which complements fertilizer and helps soil retain even more nutrients. To keep your yard and garden looking their best while maintaining the health of your soil, trade in your gas-powered equipment — including lawn mower, snow blower, and leaf vacuums — for electric-powered tools. Better yet, switch to a manual mower and stick to rakes and shovels for other lawn clean-ups: You’ll be beautifying your yard and getting a workout, too! Other benefits of using a manual or “reel” mower include fewer moving parts to break down; no oil changes; almost no noise; easier to sharpen; easier to store! There are so many ways to update your washrooms and become more environmentally friendly! Here are just a few ideas. The EPA tells us that toilets account for nearly 30% of all home water usage. A dual-flush toilet is the new standard for energy efficiency, ensuring you only use as much water as needed. Your showerhead should be the low-flow type, and add an aerator to it and to your faucet to reduce water use even further. And always look for the WaterSense sticker, the water-appliance equivalent of the ENERGY STAR label. A new exhaust fan will be quieter, use less electricity, and clear the humidity faster and more efficiently. With a remodel you have the opportunity to ensure the air is pumped properly out of your home, reducing the likelihood of mold growth and water damage from humid air being fed into the attic or between the walls. VOC-free is the way to be. These compounds are chemicals released by many products, including paint, that can cause headaches, nausea, and even emit carcinogens, and not just during painting.